Clarence van Puyster (a Greek god). Old Man Van Puyster (a proud old aristocrat). Old Man Rackstraw (a tainted millionaire). More about Clarence later. For the moment let him go as a Greek god. There were other sides, too, to Old Man Rackstraw’s character; but for the moment let him go as a Tainted Millionaire. Not that it is satisfactory. It is too mild. He was the Tainted Millionaire. The Tainted Millions of other Tainted Millionaires were as attar of roses compared with the Tainted Millions of Tainted Millionaire Rackstraw. He preferred his millions tainted. His attitude toward an untainted million was that of the sportsman toward the sitting bird. These things are purely a matter of taste. Some people like Limburger cheese. It was at a charity bazaar that Isabel and Clarence first met. Isabel was presiding over the Billiken, Teddy Bear, and Fancy Goods stall. There she stood, that slim, radiant girl, buncoing the Younger Set out of its father’s hard-earned with a smile that alone was nearly worth the money, when she observed, approaching, the handsomest man she had ever seen. It was—this is not one of those mystery stories—it was Clarence van Puyster. Over the heads of the bevy of gilded youths who clustered round the stall their eyes met. A thrill ran through Isabel. She dropped her eyes. The next moment Clarence had bucked center; the Younger Set had shredded away like a mist; and he was leaning toward her, opening negotiations for the purchase of a yellow Teddy Bear at sixteen times its face value. He returned at intervals during the afternoon. Over the second Teddy Bear they became friendly; over the third, intimate. He proposed as she was wrapping up the fourth Golliwog, and she gave him her heart and the parcel simultaneously. At six o’clock, carrying four Teddy Bears, seven photograph frames, five Golliwogs, and a Billiken, Clarence went home to tell the news to his father. CLARENCE, when not at college, lived with his only surviving parent in an old red-brick house at the north end of Washington Square. The original Van Puyster had come over in Governor Stuyvesant’s time in one of the then fashionable ninety-four-day boats. Those were the stirring days when they were giving away chunks of Manhattan Island in exchange for trading-stamps; for the bright brain which conceived the idea that the city might possibly at some remote date extend above Liberty Street had not come into existence. The original Van Puyster had acquired a square mile or so in the heart of things for ten dollars cash and a quarter interest in a pedler’s outfit. “The Columbus Echo and Vespucci Intelligencer” gave him a column and a half under the heading: “Reckless Speculator. Prominent Citizen’s Gamble in Land.” On the proceeds of that deal his descendants had led quiet, peaceful lives ever since. If any of them ever did a day’s work, the family records are silent on the point. Blood was their long suit, not Energy. They were plain, homely folk, with a refined distaste for wealth and vulgar hustle. They lived simply, without envy of their richer fellow citizens, on their three hundred thousand dollars a year. They asked no more. It enabled them to entertain on a modest scale; the boys could go to college, the girls buy an occasional new frock. They were satisfied. HAVING dressed for dinner, Clarence proceeded to the library, where he found his father slowly pacing the room. Silver-haired old Vansuyther van Puyster seemed wrapped in thought. And this was unusual, for he was not given to thinking. To be absolutely frank, the old man had just about enough brain to make a jay-bird fly crooked, and no more. Mr. Van Puyster always spoke like that. This was due to Blood. Until the servants had left them to their coffee and cigarettes, the conversation was desultory and commonplace. But when the door had closed, Mr. Van Puyster leaned forward. Clarence looked at him inquiringly. A lesser man would have betrayed agitation, but Clarence was a Van Puyster. He lit a cigarette. Mr. Van Puyster toyed with his coffee-spoon. Not even Clarence’s training and traditions could prevent a slight start as he heard the name. “Daniel Rackstraw,” repeated his father. “A man, I fear, not entirely honest. In fact, it seems that he has made a very large fortune by similar transactions. Friends of mine, acquainted with these matters, tell me his behavior toward me amounted practically to theft. However, for myself I care little. We can rough it, we of the old Van Puyster stock. If there is but fifty thousand a year left, well—I must make it serve. It is for your sake that I am troubled, my poor boy. I shall be compelled to stop your allowance. I fear you will be obliged to adopt some profession.” He hesitated for a moment. “In fact, work,” he added. Clarence drew at his cigarette. He reflected for a while. “I shall pitch,” he said suddenly. His father’s fine old eyebrows rose a little. This was no idle boast. Clarence had had a good college education, and was now an exceedingly fine pitcher. It was a pleasing sight to see him, poised on one foot in the attitude of a Salome dancer, with one eye on the batter, the other gazing coldly at the man who was trying to steal third, uncurl abruptly like the mainspring of a watch and sneak over a swift one. Under Clarence’s guidance a ball could do practically everything except talk. It could fly like a shot from a gun, hesitate, take the first turning to the left, go up two blocks, take the second to the right, bound in mid-air like a jack-rabbit, and end by dropping as the gentle dew from heaven upon the plate beneath. Briefly, there was class to Clarence. He was the goods. SCARCELY had he uttered these momentous words when the butler entered with the announcement that he was wanted by a lady at the telephone. “That’s a new one on me,” said Clarence, wondering. The season during which Clarence van Puyster pitched for the Giants is destined to live long in the memory of followers of baseball. Probably never in the history of the game has there been such persistent and wide-spread mortality among the more distant relatives of office-boys and junior clerks. Statisticians have estimated that if all the grandmothers alone who perished between the months of April and October that year could have been placed end to end they would have reached considerably further than Minneapolis. And it was Clarence who was responsible for this holocaust. Previous to the opening of the season skeptics had shaken their heads over the Giants’ chances for the pennant. It had been assumed that as little new blood would be forthcoming as in other years, and that the fate of Our City would rest, as usual, on the shoulders of the white-haired veterans who were boys with Lafayette. 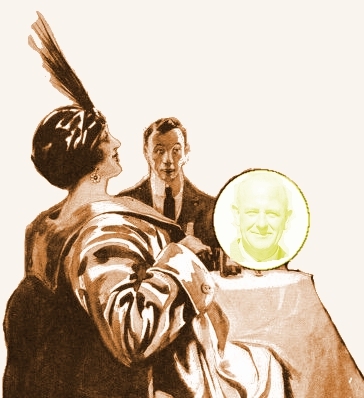 And then, like a meteor, Clarence van Puyster had flashed upon the world of fans, bugs, chewing-gum, and nuts (pea and human). In the opening game he had done horrid things to nine men from Boston; and from then onward, except for an occasional check, the Giants had never looked back. Among the spectators who thronged the bleachers to watch Clarence perform there appeared week after week a little, gray, dried-up man, insignificant except for a certain happy choice of language in moments of emotion and an enthusiasm far surpassing that of the ordinary spectator. To the trained eye there is a subtle but well-marked difference between the fan, the bug, and—the last phase—the nut of the baseball world. This man was an undoubted nut. It was writ clear across his brow. FATE had made Daniel Rackstraw—for it was he—a tainted millionaire, but at heart he was a baseball spectator. He never missed a game. His library of baseball literature was the finest in the country. His baseball museum had but one equal, that of Mr. Jacob Dodson of Detroit. Between them the two had cornered, at enormous expense, the curio market of the game. It was Rackstraw who had secured the glove worn by Neal Ball, the Cleveland shortstop, when he made the only unassisted triple play in the history of the game; but it was Dodson who possessed the bat which Hans Wagner used as a boy. The two men were friends, as far as rival connoisseurs can be friends; and Mr. Dodson, when at leisure, would frequently pay a visit to Mr. Rackstraw’s country home, where he would spend hours gazing wistfully at the Neal Ball glove buoyed up only by the thought of the Wagner bat at home. ISABEL saw little of Clarence during the summer months, except from a distance. She contented herself with clipping photographs of him from the evening papers. Each was a little more unlike him than the last, and this lent variety to the collection. Her father marked her new-born enthusiasm for the national game with approval. It had been secretly a great grief to the old buccaneer that his only child did not know the difference between a bunt and a swat, and, more, did not seem to care to know. He felt himself drawn closer to her. An understanding, as pleasant as it was new and strange, began to spring up between parent and child. As for Clarence, how easy it would be to cut loose to practically an unlimited extent on the subject of his emotions at this time. One can figure him, after the game is over and the gay throng has dispersed, creeping moodily—but what’s the use? Brevity. That is the cry. Brevity. Let us on. THE months sped by. August came and went, and September; and soon it was plain to even the casual follower of the game that, unless something untoward should happen, the Giants must secure the National League pennant. Those were delirious days for Daniel Rackstraw. Long before the beginning of October his voice had dwindled to a husky whisper. Deep lines appeared on his forehead; for it is an awful thing for a baseball nut to be compelled to root, in the very crisis of the season, purely by means of facial expression. In this time of affliction he found Isabel an ever-increasing comfort to him. 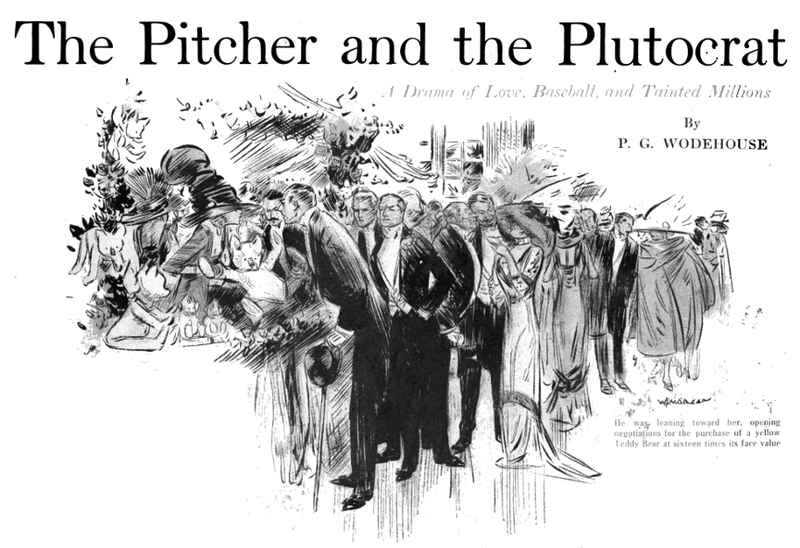 Side by side they would sit at the Polo Grounds, and the old man’s face would lose its drawn look, and light up, as her clear young soprano pealed out above the din, urging this player to slide for second, that to knock the stitching off the ball; or describing the umpire in no uncertain voice as a reincarnation of the late Mr. Jesse James. Meanwhile, in the American League, Detroit had been heading the list with equal pertinacity; and in far-off Michigan Mr. Jacob Dodson’s enthusiasm had been every whit as great as Mr. Rackstraw’s in New York. It was universally admitted that when the championship series came to be played, there would certainly be something doing. But, alas! How truly does Epictetus observe: “We know not what awaiteth us around the corner, and the hand that counteth its chickens ere they be hatched ofttimes graspeth but a lemon.” The prophets who anticipated a struggle closer than any on record were destined to be proved false. It was not that their judgment of form was at fault. By every law of averages the Giants and the Tigers should have been the two most evenly matched nines in the history of the game. In fielding there was nothing to choose between them. At hitting the Tigers held a slight superiority; but this was balanced by the inspired pitching of Clarence van Puyster. Even the keenest supporters of either side were not confident. They argued at length, figuring out the odds with the aid of stubs of pencils and the backs of envelopes, but they were not confident. Out of all those frenzied millions two men alone had no doubts. Mr. Daniel Rackstraw said that he did not desire to be unfair to Detroit. He wished it to be clearly understood that in their own class the Tigers might quite possibly show to considerable advantage. In some rural league down South, for instance, he did not deny that they might sweep all before them. But when it came to competing with the Giants— Here words failed Mr. Rackstraw, and he had to rush to Wall Street and collect several tainted millions before he could recover his composure. Mr. Jacob Dodson, interviewed by the Detroit “Weekly Rooter,” stated that his decision, arrived at after a close and careful study of the work of both teams, was that the Giants had rather less chance in the forthcoming tourney than a lone gum-drop at an Eskimo tea-party. It was his carefully considered opinion that in a contest with the Avenue B Juniors the Giants might, with an effort, scrape home. But when it was a question of meeting a live team like Detroit— Here Mr. Dodson, shrugging his shoulders despairingly, sank back in his chair, and watchful secretaries brought him round with oxygen. Throughout the whole country nothing but the approaching series was discussed. Wherever civilization reigned, and in Jersey City, one question alone was on every lip: Who would win? Octogenarians mumbled it. Infants lisped it. Tired business men, trampled under foot in the rush for the West Farms express, asked it of the ambulance attendants who carried them to hospital. And then, one bright, clear morning, when all Nature seemed to smile, Clarence van Puyster developed mumps. New York was in a ferment. I could have wished to go into details, to describe in crisp, burning sentences the panic that swept like a tornado through a million homes. A little encouragement, the slightest softening of the editorial austerity, and the thing would have been done. But no. Brevity. That was the cry. Brevity. Let us on. THE Tigers met the Giants at the Polo Grounds, and for five days the sweat of agony trickled unceasingly down the corrugated foreheads of the patriots who sat on the bleachers. The men from Detroit, freed from the fear of Clarence, smiled grim smiles and proceeded to knock holes through the fence. It was in vain that the home fielders skimmed like swallows around the diamond. They could not keep the score down. From start to finish the Giants were a beaten side. Broadway during that black week was a desert. Gloom gripped Lobster Square. In distant Harlem red-eyed wives faced silently scowling husbands at the evening meal, and the children were sent early to bed. Newsboys called the extras in a whisper. Few took the tragedy more nearly to heart than Daniel Rackstraw. Each afternoon found him more deeply plunged in sorrow. On the last day, leaving the ground with the air of a father mourning over some prodigal son, he encountered Mr. Jacob Dodson of Detroit. Now, Mr. Dodson was perhaps the slightest bit shy on the finer feelings. He should have respected the grief of a fallen foe. He should have abstained from exulting. But he was in too exhilarated a condition to be magnanimous. Sighting Mr. Rackstraw, he addressed himself joyously to the task of rubbing the thing in. Mr. Rackstraw listened in silent anguish. “If we had had Brown—” he said at length. Mr. Rackstraw shook his head scornfully. Honestly, it is but a dog’s life, that of the short-story writer. I particularly wished at this point to introduce a description of Mr. Rackstraw’s country home and estate, featuring the private ball park with its fringe of noble trees. It would have served a double purpose, not only charming the lover of nature, but acting as a fine stimulus to the youth of the country, showing them the sort of home they would be able to buy some day if they worked hard and saved their money. But no. You shall have three guesses as to what was the cry. You give it up? It was “Brevity! Brevity!” Let us on. The two teams arrived at the Rackstraw house in time for lunch. Clarence, his features once more reduced to their customary finely-chiseled proportions, alighted from the automobile with a swelling heart. He could see nothing of Isabel, but that did not disturb him. Letters had passed between the two. 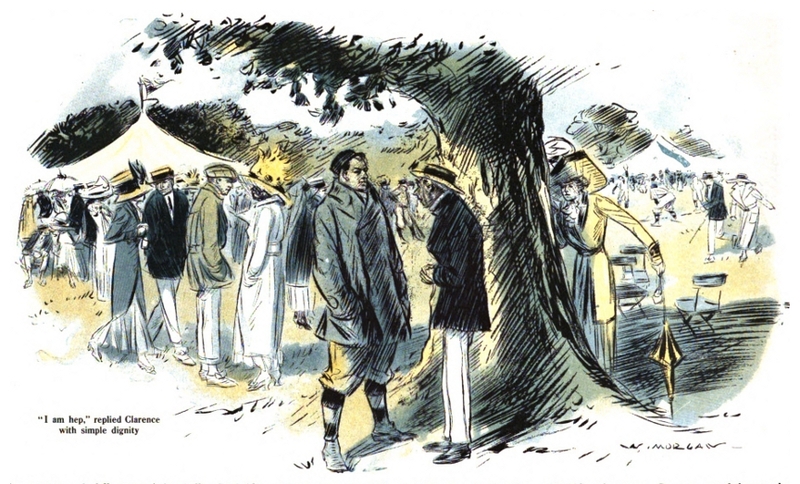 Clarence had warned her not to embrace him in public, as McGraw would not like it; and Isabel accordingly had arranged a tryst among the noble trees which fringed the ball-park. IT WAS evident from the millionaire’s demeanor that he had seen nothing. The look on his face was anxious, but not wrathful. He sighted Clarence, and hurried up to him. “A thousand, if you wish it,” said Clarence courteously. “I am hep,” replied Clarence with simple dignity. “I have got you,” said Clarence. Mr. Rackstraw looked sharply at him. “My friends have sometimes said so,” said Clarence. Mr. Rackstraw laughed. One of those nasty, sharp, metallic laughs that hit you like a bullet. Mr. Rackstraw emitted another of those laughs. “And no Wagner bat for you!” he cried. Mr. Rackstraw started as if some strong hand had plunged an auger into him. Clarence shrugged his superbly modeled shoulders in silence. “Papa!” cried Isabel, bounding happily from behind her tree. Four years have passed. Once more we are in the Rackstraw home. A lady is coming down the stairs, leading by the hand her little son. It is Isabel. The years have dealt lightly with her. She is still the same stately, beautiful creature whom I would have described in detail long ago if I had been given half a chance. At the foot of the stairs the child stops and points at a small, wooden object in a glass case. Neal Ball . . . unassisted triple play: This sounds like an impossible feat but it actually happened on July 19, 1909 just as described; see Wikipedia for details. Hans Wagner: Better known today as Honus Wagner (1874–1955), the star of the 1909 World Series for the Pittsburgh Pirates, outbatting Ty Cobb of the Detroit Tigers by .333 to .231, and stealing six bases, a Series record. 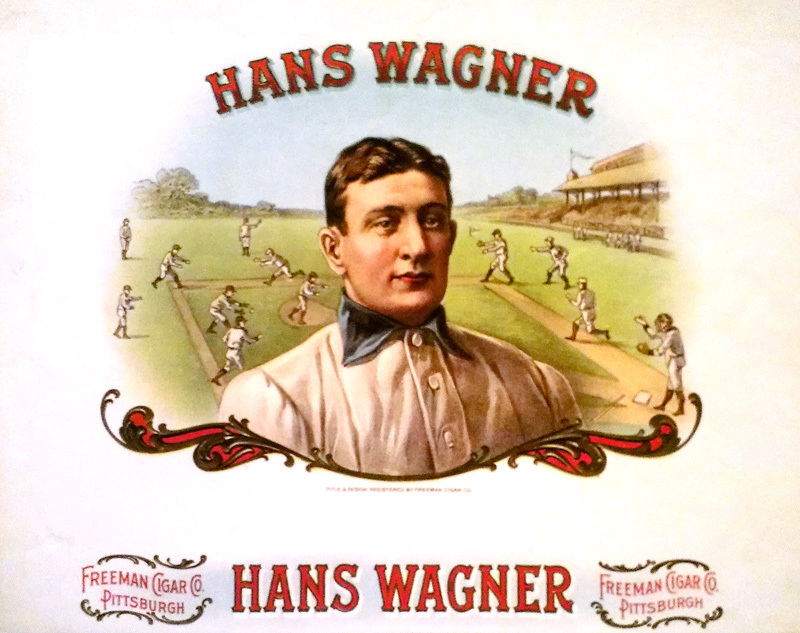 He was christened Johannes Peter Wagner by his German-born parents, and his family nickname of Hans was sometimes used during his professional career, as on the cigar box lid pictured below (thanks to Karen Shotting for the image). By the way, “Honus” should be pronounced “honn-us” not “hone-us”; it’s just an Americanized spelling of the last two syllables in the German name “Johannes.” The fact that his baseball card would become a rare collectible in modern times is a pleasant coincidence. —Thanks to Karen Shotting for research suggesting these notes. Compare the earliest version of this story, told about cricket, and the much more similar revision of this story in a soccer context.